9. Your use of this website and any dispute arising out of your use of it is subject to the laws of NSW. Even without a prior written agreement, all goods supplied are for personal use and can be offered for re-sale. We reserve the right to refuse to supply any person or company. If you are interested in re-selling our products in larger scale, please contact us to become an approved affiliate. All products are delivered via the shipping method selected during checkout. We will notify the customer if any delays are expected due to unavoidable hold-ups at Bobbleheads Australia. The customer will be requested to provide billing and shipping address details during the ordering process. Delivery will be to the shipping address (not the billing address), and the customer is responsible for providing correct address details and being available for delivery. Once your order has been dispatched, the expected transit is between 2-8 business days, depending on your location. Bobbleheads Australia will not be held responsible or offer any form of refund for delays in delivery, as this is due to a third party and is out of our control. Customers should consider that delays in responding to email communications from us will increase turnaround time. We will make all reasonable endeavours to adhere to the delivery times set out, but these are not guaranteed. We offer two free changes at different stages of the bobblehead making process. It is important that you are happy with the bobblehead at each stage as we cannot go back and make changes once you have approved that particular stage. All images on our site are either licensed or in the public domain because their copyright has expired. However, if you believe content on this website is under copyright protection, please contact us immediately and it will be removed. By ordering, the customer accepts that we have the right to publish their product on our website and/or social media. However, if notified in advance, we will ensure that products are not published by us (or removed). 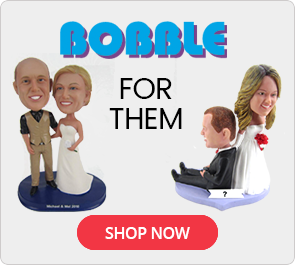 For all products offered by Bobbleheads Australia, customers are both responsible and liable for the images they upload or send by email. Bobbleheads Australia creates derivative works on customers’ behalf, based on photographs provided or stock images from the public domain. Customers are responsible for ensuring that images are available in the public domain, within fair use provisions, and copyright permissions have been granted. All of our payment options are 100 per cent secure for our customers. The order process uses secure encryption (Internet standard for secure transactions) and our secure payment service provider is PayPal. More information can be found at: www.paypal.com. 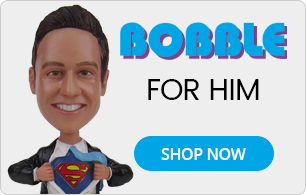 Bobbleheads Australia is committed to providing the most secure shopping experience possible. Given rapid changes in technology, we reserve the right to modify portions of our website at any time without prior notice. Bobbleheads Australia is able to refund the total order value if you cancel within 24 hours of placing your order. This offer is not available for rushed orders. Should your order be cancelled after 24 hours, 50% of the total cost will be charged for the costs of material and labour. As our bobbleheads are custom made, we are unable to re-sell the product that you have purchased. Our proofing process provides us with the best means of ensuring your satisfaction with our products. Bobbleheads Australia dolls are very well packed, and damages during shipping are rare. However, if this event does happen, we will provide you with a replacement doll free of charge. If the parcel looks damaged at time of delivery, we ask customers to open the parcels in the presence of the person delivering them. Please email us with your details and photos immediately if your bobblehead is received damaged. A replacement will be shipped to you within 15-21 business days of receiving the required information and documentation. 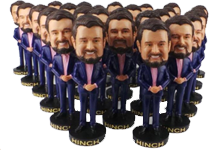 By placing your order with Bobbleheads Australia you are deemed to have read and accepted the above terms and conditions of business. Postal: P.O.Box 157, Northbridge, NSW, 2063. Warehouse: 3 Short Street, Chatswood, NSW, 2067. © 2019 Bobbleheads Australia All Rights Reserved.